The late Alan Basinet talks about collecting antique marbles, noting various design styles, manufacturers, production methods, and the regions they came from. For more information, visit his website, marblealan.com. Like most kids growing up in the late ’60s, early ’70s, I played with marbles. Of course I grew out of it, but I carried those good memories with me. Skip forward some years, and I was working in my previous profession as an archaeologist. Most of the sites that we investigated were pre-Columbian, mostly here in Florida. When we started to work on one site in downtown Jacksonville where I live, I began finding a lot of marbles. This was a part of town that’s sort of a slum now but was an early settlement right up to the Civil War. We were looking for the oldest historic evidence of human occupation there, but we kept finding all these clay marbles. Some were glazed, some were painted. I had never seen anything like that before, so I began doing research. I discovered that children had been playing with marbles for centuries and that there was a lot of variability over the years in how marbles were made. Some of them are quite spectacular-looking. So that slowly evolved into a hobby, which slowly evolved into a business, which eventually took over so much of my time that I gave up my profession in archaeology to pursue selling marbles. I’ve been doing that for just over 10 years now. I am lucky to have managed to make a living out of it. A lot of that owes to the fact that I got onto eBay almost as soon as it came around. I discovered the marble niche early on, filled it, and I have been able to maintain an edge ever since. There are so many different types of people that collect marbles. Generally the hobby attracts some wonderful people, which has been nice because I’ve been in other collectible areas before where the collectors and the dealers were a little more intense or a little more jealous. Marble collectors seem to be able to get together and just enjoy showing off their treasures. Collectors Weekly: Do you specialize in a specific type of marble? Basinet: Not really. As far as selling goes, I’ll sell any type of marble that’s consigned to me. Some of the earliest marbles are made out of stone and clay. With a few exceptions, those don’t tend to be as collectible as the glass marbles from the 1850s. Handmade glass marbles are some of the most collectible, but the 20th century, machine-made marbles, mostly from America, are perhaps some of the most popular marbles on the market right now. There are still some companies that produce marbles here in the U.S., and there’s a very large company in Mexico as well. People are still making and collecting machine-made marbles. Over the past 20 years, particularly in the last 10 or so, artists working with glass have turned their attention to making art glass marbles. Since the late ’90s, it’s become a major part of the market. The only reason you would call them “marbles” is because they happen to be round and made out of glass. Some of these handmade modern marbles are 6 inches in diameter. Of course they’re not meant to be played with, but they provide collectors with some beautiful objects to acquire. I can’t even begin to express how talented some of these people are. The earliest glass marbles were generally made by creating long canes that would have a clear or transparent-colored base surrounding tiny rods of colored glass. The molten blob would be pulled to create a slender cane that might be 20 to 50 feet long. The cane would be heated until it was maleable enough to be twisted and cut at one end with marble scissors, which were created around 1846 and had a little cup on them that would help form the hot glass into a perfect sphere. Handmade marbles can be identified by their rough ends, which we call pontils. That’s how most people identify handmade vs. machine-made marbles. Even though they might be in mint condition and never played with, they’re going to have little, rough ends from where they were cut off the cane. Almost all of the early handmade marbles were made in Germany. The Germans really had the marble market locked down. They made a lot of glass toys, particularly in the Thuringen portion of the country. But when World War I began, we embargoed anything coming out of Germany, so Americans were no longer able to get glass marbles they were making, which spurred Americans into looking at alternative methods of creating marbles. Through a series of patents, the marble-making machine was perfected. Marbles were no longer required to be made by hand. The process could be fully automated and they could pump out millions of marbles a day. Collectors Weekly: Were there also handmade American marbles? Basinet: There were a few. There are some types of marbles that a lot of collectors call transitionals. For example, there were a number of glassworks in and around Akron, Ohio that came into being in the 1890s. They pretty much all made the same type of marble by gathering molten glass on the end of a rod. We call these hand-gathered marbles. They rounded the gathered glass with machinery, so it was partly handmade and partly machine-made, thus the term transitional. The first company that produced marbles almost entirely by machine was M.F. Christensen & Son Company of Akron. They went out of business in 1917. Around that same time, another company called Akro Agate began business in West Virginia. Once they came into being, all these smaller companies came about, mostly along the Ohio River in West Virginia. Throughout the 1920s, ’30s and ’40s, tons of marbles were being produced. This was when marble playing as a hobby was at its apex . In terms of collectibility, a lot of those marbles are still around, especially from the ’30s and later. Some of them can be quite valuable because they were rare to begin with, but most collectors look for marbles that have the least amount of damage. That can be problematic since they were made as toys and were played with by children. To find old marbles in mint condition can be very challenging. Some marbles from the mid-1800s can go for thousands of dollars apiece if they’re in mint condition because they’re so rare. Collectors Weekly: Were Germany and America the only two big centers making marbles? Basinet: Almost entirely. But marbles began being produced in Japan as early as the 1930s. After World War II, when Japan was still occupied by the U.S., they began creating their own marbles. It didn’t take long for the Japanese marble industry to almost completely wipe out the American marble industry because they were producing marbles so cheaply and in such great numbers that Americans just couldn’t keep up. They’re the ones that popularized the cat’s eye. American companies made some cat’s eye marbles, too, but almost all Japanese marbles were cat’s eyes, and that was what children really wanted. Around the same time, the company from Mexico that I mentioned began creating machine-made marbles. You can even find marbles that were made in Czechoslovakia. Collectors Weekly: Was there machine-manufacturing in Germany as well? Basinet: Yes, but we don’t know much about it. Before the Berlin Wall came down, the region of Germany originally making the most handmade marbles was in Communist hands, so there was very little contact between people living over there and the West. We know that they began making machine-made marbles in Germany in the ’30s and throughout the ’40s, ’50s, and ’60s, but there are none being made in Germany now, except for a few artists who carry on the tradition of handmade marbles. There’s one guy over there making marbles today whose forbearer actually invented the scissors that allowed marbles to be cut from canes, so he’s got a direct connection. His ancestors settled that part of Germany in the late 1500s when they began making glass toys over there. It’s all pretty fascinating and has a lot of history behind it, but most collectors just enjoy the color and beauty of the marbles. Collectors Weekly: Were the first marbles in Germany glass or other types of materials? Basinet: The earliest marbles were actually made by the Dutch and they were made from stone like limestone that was ground into spheres. If you go further back, the ancient Romans and Egyptians made glass spheres, but I wouldn’t exactly call these marbles other than they share the trait of being made out of glass and they’re round. I’m not really sure what games they were used for. The actual marble game was invented by the Dutch in the 1500s and 1600s. In fact, the term “marble” came from those that were made from marble, even though those are very difficult to find and they’re not really valuable because basically it’s just a rock. They’re interesting historical pieces, but people don’t pay big money for them. So the Dutch began making marbles from stone first, and then the Germans followed, making marbles from a form of agate. In the early or mid-1800s, people began making marbles from clay, using different firing processes to make different types of marbles. Some would be low fired and maybe not even dyed or painted when they were done. They’re just like little plain brown balls of fired clay, not too attractive, and I’m sure they were cheap for the children back then. Others were glazed, sometimes with designs on the surface, and were intended for the more affluent children of the day. We don’t see as many of those as we do like the common clays. Collectors Weekly: Were marbles always made for children’s games? Basinet: Almost always. 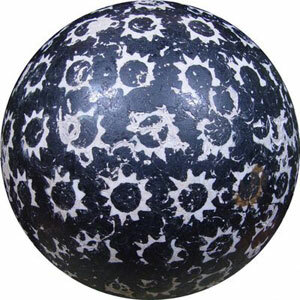 Some of the early handmade marbles are more than two inches in diameter, particularly those from about 1850 to 1870. They were made for adult games like carpet bowling, a game that was very much like today’s bowling, but played on the carpets of Victorian houses. Some of the larger handmade glass marbles were also used for that purpose. Generally speaking, any marble made that was under an inch was produced for children’s games. Collectors Weekly: Who are some of the major manufacturers in Germany and America? Basinet: As far as we know, there are at least a dozen glassworks sites spread out in the Thuringen region in Germany. That’s really where handmade glass marbles were born. We know the names of few of the manufacturers, but as of yet we have no way of differentiating which glassworks made which marble. We just know it came from one of them. So collectors don’t usually refer to the names of the glassworks. They just lump them all together and call them German swirls. The first big name in America was M. F. Christensen. There was also Akro Agate, which for a long time was the leading American manufacturer of marbles. They were in business from the late 1910s up until about 1950. Other companies include Peltier Glass Company, Christensen Agate Company, Vitro Agate Company, and there are probably about a dozen more I could rattle off, mostly smaller companies that produced a specific type of marble. As far as any still in operation today, there’s Marble King, which has been in business since the mid-1950s, and Jabo Inc., which is a company that actually grew out of Vitro Agate. Currently, they are the only two American manufacturers—just about everything else is coming out of Japan or Mexico. If you go to Wal-Mart or almost any store that sells toys, their marbles are going to be from Mexico. American companies make children’s marbles too, but they mostly make industrial marbles which are just plain and used in spray cans and things like that. Collectors Weekly: What are the other differences between the vintage and contemporary marbles? Basinet: Since World War II, glass has been made more cheaply. The colors are less vibrant and they’re usually applied to the surface of the marble over a clear base. There are different designs, different colors, different glass quality. A lot of the traits about them are different, but some are the same too. Marble machinery hasn’t changed that much since it was first invented. There were just a few tweaks here and there that made the marbles come out looking different. Collectors Weekly: Are there different phases of marble design? Basinet: Sure, but there’s a lot of overlap too. Some of the earliest marbles made in America are called slags. They have a clear or transparent-colored glass base with white swirled in. For the longest time, those were what the major American marble manufacturers were producing, with a few exceptions called onyxes that tried to replicate the appearance of stone, like carnelian, agate, and even gemstones. They were intended to look like stone marbles because in the late 1800s and early 1900s, stone marbles were among the most expensive marbles for children to buy. If you owned a stone marble, you were considered a rich kid. As new techniques were developed, new designs came out. You can come up with a taxonomic chart of all the different styles, but there’s no really smooth transition from one type to the other. All the styles had different names. In some cases the companies gave them names, in other cases the children gave them names. Some of those names are still used by collectors, who come up with their own names to describe the old styles. Different collectors might call the same marbles different things. It gets complex, and everyone’s got a different opinion when it comes to naming a marble. If you go to a marble show, you’ll hear people talking about the marbles in what sounds like a foreign language. Some of the later popular marbles were called corkscrews. They had two or more colors with one color spiraling on top of another. Those were produced by Akro Agate, and they were actually given different names by the company, depending on the style. They were mainly called specials, but we collectively put them all into one group called corkscrews and then there are different types within the corkscrews—onyxes, snakes, Popeyes. It gets very specific. 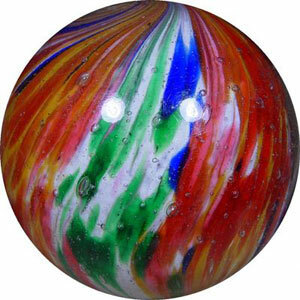 There are also marbles from other companies that are given colorful names. A lot were named after superheroes. All collectors recognize the Superman or the Spider-Man. The Superman is a particular marble from a company called Peltier, and it has a blue base with red and yellow stripes or ribbons on it, the colors of Superman’s suit. Spider-Man is the same—it’s a red and blue marble. Some names have more meaning than others among collectors because some are just so difficult to find. There’s a marble from Christensen Agate called the guinea that was never very popular with children and was quickly discontinued. Today, some of those guineas can sell for upwards of $500 and more. It’s not like collecting coins where you pretty much know everything that’s out there and how much was made. With a coin, you can also tell exactly the year it was made. I’ve been doing this for more than 10 years and collecting for an additional five. Probably a week doesn’t go by when I don’t see a marble that confounds me. I don’t think I will ever see every variation that’s out there. You can stick with this hobby your entire life and never get bored with it. Collectors Weekly: Did manufacturers make the same marble over and over? Basinet: Sort of. Every day they’d fill up their tanks with different colored glass and run hundreds of thousands of marbles of the same color combination. Everything looks the same, although there are going to be slight variations in the design, depending on the machinery. A lot of the machinery just pumps in random swirls. They might create nearly a million of those in a single day and fill up a box car with them. The next day they change the glass and run the same type of marble but in different colors. We see a lot more of some types of marbles than others. Some were met with a lot of enthusiasm from children so they made more of those. Others weren’t as popular and they had to take into account the expense, because a lot of these really early marbles were made with high-quality glass. The man who came up with a lot of the colors for Christensen Agate and Akro Agate had also worked at Cambridge Glass. So you have marbles that really are made with some of the highest-quality glass from that era as opposed to today where marbles that you’d buy in the store are cheap glass that shatter easily and have less- intense colors. Christensen Agate began in 1925 but was out of business by 1931. Their glass was such a high quality that the Great Depression hit them hard. But during those six years or so, they created some of the best machine-made marbles around and are among the top collectibles. Collectors Weekly: You mentioned that cat’s eyes were popular among children. Are they also popular to collect? Basinet: They aren’t especially popular, but collectors have given them a little more attention in the past five years or so. We’ve identified some types that are actually quite rare. It’s challenging to find them because for every 10,000 cat’s eyes you look at, you might find one or two that are worth saving. Most cat’s eyes are just cheap, ugly-looking marbles, but there are people who collect nothing but cat’s eyes and love them very much. Collectors Weekly: What are some of the most sought-after marbles? Basinet: It would be difficult to answer that in terms of the design. There are Christensen Agate marbles out there that sell for thousands of dollars, but they don’t have a specific name, just a name that describes them all as a group, like striped opaques or guineas or swirls. 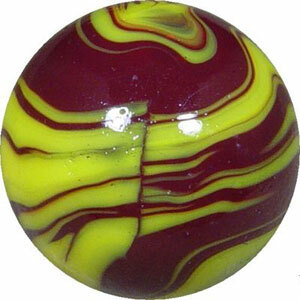 These marbles had the best colors, so they tend to be the most popular among collectors. Among handmade marbles, some styles are much rarer than others. For instance, the Joseph’s coat style is much rarer than the Laticinio, so they tend to be more collectible. The term “lutz” refers to a substance called goldstone that was put in handmade marbles. Just about any handmade marble with goldstone, or lutz, is desirable. Onionskins are very popular among handmade marble collectors, too. If you could deconstruct an onionskin marble, you’d see multiple layers beneath that outer layer. Figural marbles are some of the earliest of the handmade marbles. Those are known as sulfides. A small, usually unpainted white figurine is injected, if you will, into molten glass. Those weren’t made from canes like most handmade marbles from Germany; they were pretty much hand-gathered. You gather a glob of clear glass on the end of a rod and stick the figurine in it while it’s still molten. They were difficult to make because the figurine or the glass itself might shatter because of the differentials in the material temperatures and density. They’re the most attractive marbles and they tend to be highly collectible because they’re quite rare. To find any of those unplayed with in mint condition is quite extraordinary. 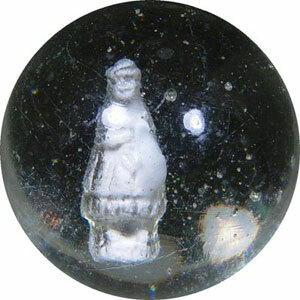 Collectors Weekly: Did marbles have any connection with paperweights or other glass objects? Basinet: There are some similarities, but less than you’d imagine. It’s very unusual to see a millefiori handmade antique glass marble. There are a few, and they’re called paperweight marbles, which is sort of an oxymoron because they’re round marbles, not paperweights with flat ends. But they appear very similar and may have been made in the same country. 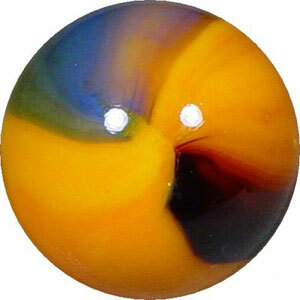 Other than that, most paperweights are completely different from marbles. Collectors Weekly: Did marble companies make other glass items? Basinet: Akro Agate was the leading manufacturer of marbles in the U.S. for a long time, and they also made other items, such as a whole children’s line of toy dish sets. They also made ashtrays, urns, and planters. Those are very collectible on their own. Akro Agate is a term that you’ll hear not only among marble collectors but also glass collectors, especially Depression glass collectors. Collectors Weekly: Is the term “art glass” associated with marbles? Basinet: We call any modern marble that’s made by hand “art glass.” There have been a few exceptions coming out of China and Mexico, but almost all modern marbles that are made by hand are created as art pieces and not for play. The artists that produce them are some of the top artists in the country. You have to add the modifier to make sure people realize that we’re not just talking about a children’s plaything—we’re talking about a piece of art that can fetch thousands of dollars, depending on the artist. Collectors Weekly: What are the steps you take to identifying a marble? Basinet: That’s the million-dollar question. If I had an easy way of answering that, I’d be rich. Learning to identify marbles on your own is difficult. If you’re a new collector, the way to do it would be to determine what they’re made of. It should be pretty easy to figure out if they’re glass or clay. If they’re glass, then you have to try to figure out if they’re machine-made or handmade. I recommend people just take the marbles and try to group them together with others that are as similar as possible and begin looking for common traits. Once you’ve mastered being able to tell the difference between a machine-made marble and a handmade marble, then you can start worrying about the subcategories of what type it is and who made it. The learning curve is steep and requires lots of hands-on experience. I don’t have any identification books on hand—I haven’t used them for a decade. I remember being completely confused by them when I began this hobby. They did me very little good, and it wasn’t until I started talking to other collectors who showed me the ropes that I began to pick things up. I would urge anyone interested in the hobby of marbles to begin by finding a show in their area because marble collectors are always happy to talk to newbies about some of the finer points of identifying and collecting. Collectors Weekly: How do you determine if a marble is a fake? Basinet: I’ve gotten really good at it because there are certain things that I’ve just learned to look for, but it’s hard to translate that into a couple of sentences. You really have to know your marbles. Obviously, with fakes and reproductions, there has to be a financial interest for the person producing it, so the more expensive marbles are the ones that people are going to try to replicate. I would just say if someone offers you a deal and it sounds too good to be true, like they’re offering you a type of marble that you know in the books goes for about $500 and now you can get it for $100, then beware. Other than that, I would just say that you have to start off slow and work your way into the hobby before you start laying out money. Never lay out more money than you’re comfortable with and buy from someone who’s reputable. Find someone you trust. Other than that, it just takes a lot of education because trying to describe in words the difference between a fake and an authentic marble is impossible. Even showing pictures would be difficult. I inspect the marble with a 30-power loop before I can start seeing that there are tiny nuances in it that let you know that it’s not what it’s purported to be. It’s not a huge problem with our hobby, not like it might be with some others. Collectors Weekly: Are there shows and clubs? Basinet: Yes. I used to try to get to shows quite a bit. I couldn’t tell you how many are held each year, but there are quite a few. Some are large, some are small, but all are fun. You can go to some marble-related websites and find the locations. Some of the oldest shows have been going on for 25 years. There are also a lot of clubs, which sponsor many of the shows. You can join a lot of the clubs for small membership fees and get quarterly or monthly newsletters that’ll keep you updated on when shows are taking place. Some of the clubs are national or international, others are regional. A good one is the Marble Collectors Society of America, or MCSA. It’s been around for probably 30 years. They don’t organize shows anymore, but they still put out a newsletter. Then there are clubs like the Buckeye Marble Club in Ohio. They host two shows every year which are among the most popular shows right now. There are a lot of marble discussion forums online, too. That’s where newer collectors go. There’s a jerk in every crowd, of course, but for the most part, when new beginners go to these forums and ask questions, people are very eager to help. A lot of people might see something on eBay, for instance, but they’re not sure about it, so they post a link on one of the forums and then others can comment. It’s a good way to get additional information. Collectors Weekly: What have you noticed about the age group of marble collectors? Basinet: Some people start out very young, usually with the encouragement of their parents, but I know collectors who are well into their 80s. If there’s one demographic group that really sticks out as being more prominent than others, it would be middle-aged men. I think with men, nostalgia plays a more important role in collecting. There are a lot of female collectors. For the most part, I think women are a little bit more likely to be collectors of contemporary art glass marbles because of their beauty. Most male collectors like handmade and machine-made marbles that remind them of their youth. Male or female, a lot of collectors are clustered in the Midwest in little towns. Some of these towns may have populations under 10,000, but they’ll have five or six serious collectors. I’m assuming the reason is networking. Most American marbles were crafted in Ohio and West Virginia. Those are the states where there are also the largest numbers of collectors, which makes sense. Collectors Weekly: Is there anything else that you want to add that we maybe missed or that you can think of about marbles or collecting? Basinet: They still sell marbles in stores, so I’m thinking some kids still play with them even though video games seem to have overshadowed that. It’s a long tradition, a part of our American and European cultures, so I hope kids will continue playing for a long time. We have some marbles that we were told were made of mud – circa 1880’s can you give us any information about these. These came from the Missouri area. Great article! Alan has done a fine job over the years learning about marbles and sharing his knowledge. Superb article. Mr. Basinet comes across as wonderfully knowledgeable and he imparts his knowledge with style and flair. I hope to meet him some day at a show or gathering. What a great article! Alan has a real gift for making a complicated subject accessible to anyone. And I echo the previous comments about Alan’s generosity in sharing his knowledge with others. The subject of fakes was touched upon here, with regard to marbles that would fool an experienced collector. However, a whole other article could be written about fakes made to fool the unsuspecting and inexperienced collectors. “Civil War”, “Tennessee River”, and “Sharpie” Chinas abound on ebay and at flea markets, along with hundreds of fantasy bags with such labels as Roy Rogers, Girl Scouts, or John Deere. Knowing that some people lie (or just plain don’t know) about what they have was a valuable lesson for me. You could not have interviewed a better person than Alan. He is one of the most honest and generous persons I have encountered during my marble collecting life. He will share his knowledge with anyone who asks and go out of his way to help anyone. A wonderful article about a wonderful person.. I have just started collecting marbles and yet, I have all kinds of questions. There are some I still have trouble identifying, some patch types or patches of 3 or more colors. I don’t know who to go to that would be honost with me or to have them appraised. Do I need to get involved with marble shows, clubs, etc.? I found this article very informative. I started buying old marbles at flea markets etc. back in the mid-70’s. Now, I myself am an “antique” in MY mid 70’s… and cleaning out my “stuff” in preparation for moving. How do I go about selling these “jars and jars” of marbles? I live in the Pittsburgh, PA area. Does anybody know of a reputable dealer or buyer? Thank you for your help in this matter. Corinna, marble shows and clubs are the best, but online marble collecting forums are also good. Bring your pictures and questions to http://marbleconnection.invisionzone.com/ board for example. Marble collecting forums tend to have pretty high activity. Marilyn, you could ship all your marbles to Alan Basinet (this article’s interview) and trust his fair and honest dealing. He has such a high reputation among marble collectors that his consigned auctions fetch premium prices. I recommend though, that you learn enough about marbles to separate out uncollectable or low value ones to save shipping costs. You would do well to visit an online marble collecting board also. Maribeth Keane and Jessica Lewis did a dynamite job interviewing Alan. Wow!!! Really great read! Great interview. Alan is tops in the marble world. Alan is one of the all time best folks you can ever hope to encounter! His knowledge and identification skills are well respected in the community, and his candor and friendliness are always present. May the LORD of all creation watch over Alan, guide and guard his heart, mind and soul! Mineral marbles spheres were left out. Basically a ball of rock mineral or quartz that is ground down meticlously into a sphere. often gripped by strong crafty vulnerable human fingers. The germans made mineral marbles this way as well. You want roots? Native americans ground out such mineral spheres in creek side stones slurry cups. Mineral spheres of today ( if made in America )are often produced in an American device known as a sphere machine ..This process involves placing the “rough”in the midst two or three swirling slurry cups spun in opposition to each other. Sphere producing grinder spinners that cut grind shape polish “rough” rocks into balls or spheres. one gritof coarsenesses at a time from rough to fine grit to finishing polishings. Q: What is a Tell tale sign of a mineral marble ? A.:Well indoors they are colder to the touch than counterpart”KNOCKOFFS”( glass spheres).except steel ball bearings which is a whole nother story. Because minerals stones by nature hold cold deeper &longer, indoors than glass. You located the correct person for this interview. Good information by Alan as always. As said above and many times before,a honest,friendly,helpful,wonderful person. If you have a interest in marbles do not miss any opportunity to spend time with Alan. Alan’s interview is very interesting and informative. I started collecting marbles about 30 years ago when I came upon some very beautiful, strange looking marbles in a flea market in Joplin, Mo. I had never seen anything like them before. My mother was with me and she had not seen marbles like them either. I spent all the cash I had with me then (around $60.) and went home with some fine jewels. I learned from books and shows and personal experiences over the years and have really enjoyed collecting all kinds of marbles. That marble “find” of 30 years ago included a large blue and white onionskin, a lion sulphide, 2 ribbon core lutz and 2 large agate spheres, all of which were mint except both 3/4 ” lutzes had small fractures in the red ribbon cores. 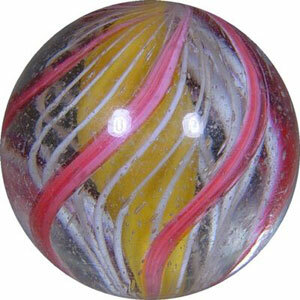 Also included were 2 clear core banded lutz marbles, 7/8 “. One had a single yellow outer band alternating with the lutz bands while the other had a light blue band. I want to thank Alan and Ms. Keane and Ms. Lewis for conducting the interview. How do you identify whether a stone ball is actually a carpet ball? Any information is much appreciated. I am new to the computer. SO I HAVE just begun to explore information about my marbles I have thousands. Many which have pontil marks,a few I have found in the woods with Indian arrow heads “they are clay”. I found your information very informative. I would like to sell them could you please offer me futher information? Thank you. perplexing for experts as it is for beginners. such unique beauty is a compelling draw. reproductions have surfaced in Virginia. are crude& rough, while a few are pinoint. Any info/ input would be appreciated! Enjoyed reading your article. My wife wanted to see my old marble collection which I have had for 56 years. I used to take 5 marbles to school each day. If I lost the 5 marbles, I would hunt on the school grounds until I found one and then I would play again. I would end up, at the end of the day, with a small bag of them. I have 100’s of marbles to this day. I started playing marbles in 1954. Hope you enjoyed my story. Were marbles ever made from wood? My mom has what she has always called a “creeper marble.” She told me about 30 years ago that it was over two hundred years old. It about 2+ inches, clear and has a little white rabbit in it. It is somewhat crude in its making. She says it is called a creeper because it was rolled in front of a baby and the baby would creep after it thus learning to crawl. I am in my fifties now and, even though we were never allowed to play with it, I still love it. It fasinates me! Does any one have any information about this creeper marble? Thank you! I’ve come late to Alan’s interview and believe it should be required reading for anyone new to the field of collecting marbles. Alan was a gem of a man and a great loss to us all. He brought a passion to the collecting and business of marbles that has been rarely surpassed. You are sorely missed Alan. when taking pictures of the marbles, how do i group them? i’ve been collecting marbles for 50 yrs. it’s not a hobby. I’ve never bought them.I either found them or they were given. I dont want them anymore just want to sell them. I know some are worth money. I know very little of marbles. but i do have alot. Can you please help me. thank you.